In January, I cheered with old and new friends, long lost relatives and thousands of strangers as the Oregon Ducks took the field at the Rose Bowl. 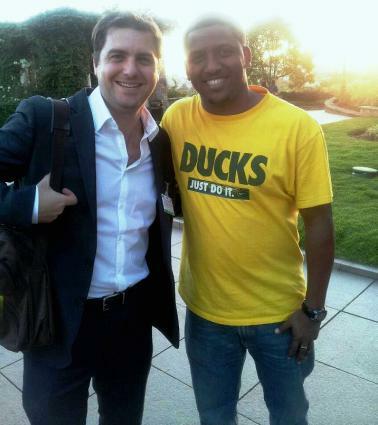 In February, it took eight hours before I encountered my first Ducks fan in Addis Ababa, Ethiopia. 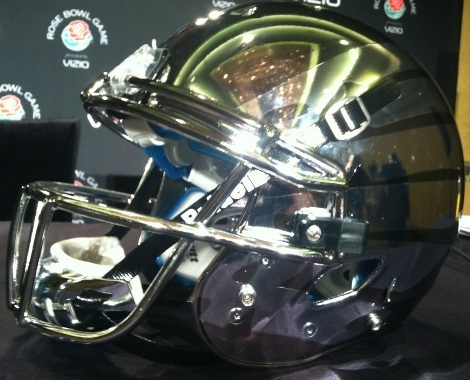 He had never seen a game live or on TV, but he knew the Ducks prevailed in Pasadena and that, "The helmets were the most incredible thing I've ever seen!" In March, I sat with a friend and colleague to watch a video about LRA leader and indicted war criminal, Joseph Kony that garnered 70 million views in four days. We cringed, we mocked, we attempted to hide welling emotions at crescendo moments. Then we took to Twitter and our inboxes to monitor the steady stream of support and criticism directed towards Invisible Children and Kony 2012. Kony 2012 oversimplifies on issues of policy; it reinforces dangerous societal viewpoints of Africans and the regions problems; it promotes a "White Man's Burden" hero culture; it makes outrageous and unsubstantiated claims about Invisible Children's impact and the campaign's potential. Yet, it is beautiful and brilliant. Anyone who cares about building movements of positive change should study this film, and their investigation should start with understanding the, "Attention Economy." If the Web and the Net can be viewed as spaces in which we will increasingly live our lives, the economic laws we will live under have to be natural to this new space. These laws turn out to be quite different from what the old economics teaches, or what rubrics such as "the information age" suggest. What counts most is what is most scarce now, namely attention. The attention economy brings with it its own kind of wealth, its own class divisions - stars vs. fans - and its own forms of property, all of which make it incompatible with the industrial-money-market based economy it bids fair to replace. Success will come to those who best accommodate to this new reality. Those prescient words began scholar Michael H. Goldhaber's, 1997 paper, The Attention Economy: The Natural Economy of the Net. At the same moment designers and marketers at Nike's sprawling campus in Beaverton, Oregon were launching a 15 year experiment to test Goldhaber's premise. The proving ground would not be the Internet, but a football field in the small city of Eugene, Oregon, home of the ferociously named Oregon Ducks. Nike co-Founder and 1959 Oregon alum, Phil Knight had secured a deal with the school -- he would provide a blank check to support the athletic department's stadium and facility upgrades in exchange for Nike having carte blanche design control for the football teams uniforms and merchandise. While the university gained an indoor practice facility in the rainy state (though fans proclaim, "It Never Rains at Autzen Stadium! "), Nike Creative Director, Todd Van Horne, and top designers like Tinker Hatfield had the chance to create a football powerhouse through the principles of the Attention Economy, as brilliantly detailed by Michael Kruse last August in, "How Does Oregon Football Keep Winning? Is it the uniforms?" Kony 2012 has succeeded by being controversial. It will anger many and be dismissed by others, but it has deeply engaged youth. It has also succeeded by stirring criticism. As the Ducks discovered, dissent is not anathema to attention. In fact, dissent and disdain are vital ingredients. 4500 stories have been written about the film in the past 24 hours, which also means 4500 stories have been written about Kony and the LRA. The frenzy has given attention to countervailing voices like the stinging critique by Michael Diebert on Huffpo and eloquent response by Ugandan journalist Rosebell Kagumire that has been seen by 150,000 people and counting. Like the Oregon-Nike experiment, Kony 2012 is a startling and stunning success in the Attention Age. We should spend less time denouncing that reality and more time understanding and shaping it. We can decry Kony 2012 for misinterpreting the current political reality of Uganda or wish equal attention was focused towards the ongoing massacre in Syria, the plight of women and the coming food crisis in the Sahel, but as my friend recently returned from West Africa commented, "That is not this guy's fight." Thoughtful critiques should continue, the more ink spilled the better. However, in the midst of our doubts, we should remember that there were millions of young people who had never heard of the International Criminal Court, Joseph Kony or even Uganda a mere four days ago. Russell's passion ignited theirs. That should be celebrated. Not because they will, "Blanket the night" on April 20th, but because these youth will seek to prove Kony 2012's grandiose claim that in a connected world they can and will stand up for each other. In a world of Bieber and Twilight they choose to turn their limited attention to human rights and justice. I for one welcome their limitless optimism.